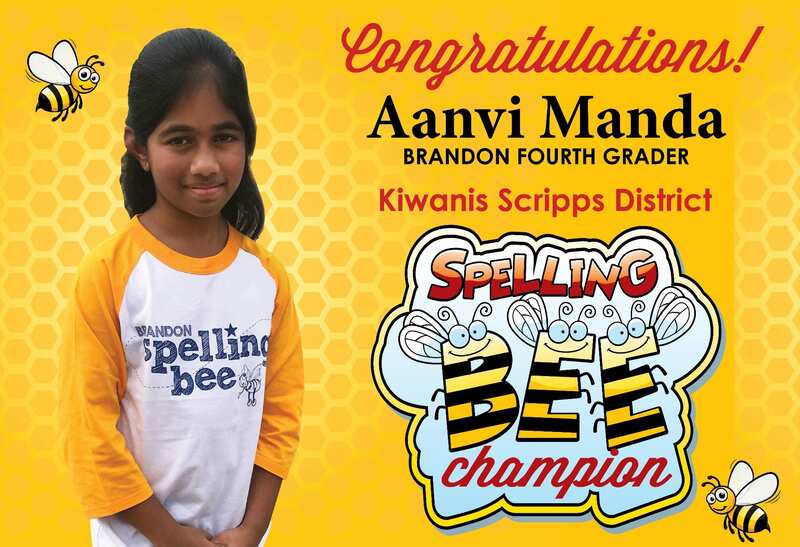 Aanvi Manda, Brandon Elementary fourth grader, takes home the coveted Webster’s Dictionary as the individual winner of the Kiwanis Scripps District Spelling Bee held this past weekend at Lufkin High School. Although this is not her first time to compete, Aanvi felt she had a better chance at winning since she had placed fourth a couple of years ago in the competition. The winning word was ‘agitated’, and Aanvi said she doesn’t remember actually studying that word in particular but was sure she had seen it before in books. Sydney White, spelling bee coach and fourth grade teacher at Brandon Elementary, helped Aanvi work on the extensive list of words the students have to be familiar with for the bee. Aanvi also said her mom was a huge help at home going over the words with her. Aanvi loves to read and is currently reading on The Unwanted Series. This love of reading calms her down before the spelling bee. “I read. It helps my concentration . If you try to cram words the last minute they evaporate from your head because you’re so worried. You won’t remember it all,” she said. Just to get to the Kiwanis Spelling Bee she competed in the Brandon Elementary spelling bee. Twenty-one students were chosen for the oral bee based on a written spelling test with Aanvi taking the prize. In her spare time, Aanvi likes to experiment building with Legos, drawing, doing puzzles and taekwondo. She also has a 3-year-old sister who sometimes draws with marker on her homework. She has big plans for what she wants to be when she grows up. “I wanted to be a doctor, but I’m a little bossy so I may be an entrepreneur, maybe in building or engineering,” she said. Aanvi will advance to compete at the Houston Public Media Spelling Bee in Houston, which will be televised on March 23.